Irving Melrose “Cy the Second”/“Young Cy” Young was born on July 21, 1877, and raised in Colum­bia Falls, Washington County, Maine, in the state’s “Downeast” area. His father, William Wallace Young (1844-1911), worked as a farmer at the time of the 1880 census, and he and his wife, (the former Syldania French), raised six children — Rowland, Orie, Minerva, Sewall, Mabel, and their youngest, Irving. Young was 5-feet-10 and listed at 170 pounds. At age 27 in 1905, Irv Young had his shot at the major leagues. He made the most of it. He led the league in three categories: most innings pitched (378), most games started (42), and most complete games (41). He was second in the league in shutouts with seven (only the immortal Christy Mathewson, with eight, had more) and fifth in strikeouts. His earned-run average was 2.90, respectable in any league. And he won 20 games. Yet, alas, he lost 21. But let’s discount that. Irv Young, in playing for manager Fred Tenney and the 1905 Beaneaters, was playing for one of the more inept teams in baseball’s long history. Let’s concentrate — and celebrate — on the fact that he won 20 games. As a rookie. All these years later, Young’s 1905 total of 378 innings pitched and 41 complete games are still major-league records for a rookie. Needless to say, in this day and age of almost incessant relief pitching, they are records that will most likely last forever. And that's a long, long time. Irv’s total of seven shutouts was also a long-standing rookie high, tied by Pete Alexander in 1911 and by Jerry Koosman in 1968, and eventually broken by Fernando Valenzuela in 1981. Young’s banner season started well. He appeared in relief, pitching the final four innings of the Beaneaters’ April 14 Opening Day game before a crowd of 40,000 at the Polo Grounds. And he pitched effectively, holding the soon-to-become World Champion McGrawmen to but four hits and two runs. He also knocked in Boston’s only run in the eighth inning. Four days later he started the club’s home opener, gaining his first major-league win in a 4-2 performance over Brooklyn. He limited the Superbas to seven hits and walked only one. According to the New York Times, the man whose nicknames compared him to the legendary Cy Young “made an excellent impression, striking out six men and keeping the Brooklyn hits well scattered.”5 On the 28th, Irv pitched the first of his seven shutouts of the year, holding the Phillies to three hits in a 2-0 Boston win. “Inability to hit Young's delivery was responsible for the home team’s defeat today by Boston” was the rather quaint way the Bangor Daily News explained the game’s out­come. On May 6, Irv bested Christy Mathewson in a 2-1 cliffhanger. The Giants managed but seven hits off the Boston southpaw. Irv picked up his second shutout on May 11, scattering 10 Chicago hits in a 5-0 match. South Bridgton, Maine, native Wirt Virgin “Rip” Cannell — who played all 154 games in the outfield for the Beaneaters that year — got the game’s only extra-base hit, a double. May 15 — Beats Reds, 2-1, on a nine-hitter. May 23 — Tosses a five-hit shutout over the Pirates, 1-0. May 27 — Tosses another shutout in three-hitting the Phillies, 3-0. July 10 — Defeats the Phillies, 3-2. July 13 — Five-hits the Reds in a 6-1 Boston win. July 24 — Tosses four-hitter vs. Pitts­burgh in an 8-1 win. August 21 — Allows five hits and strikes out seven in downing St. Louis, 1-0. September 1 — Tops Brooklyn, 4-2, on an eight-hitter. September 13 — Six-hits the Phillies in a 3-2 win (while also getting two hits and scoring a run). September 20 — Defeats Brooklyn, 6-5, with a bases-loaded triple by Cannell the big blow. What’s amazing is the number of games Irv Young could have — and probably should have — won in 1905. If he had come away victorious in all the games he lost by one run — mostly all by scores of 2-1 or 3-2 — he could well have been a 30-game winner. Wouldn't that have put Columbia Falls on the map! The truth is that the Beaneaters were terrible. They won but 51 games the entire season (while dropping slightly more than twice that many, 103). Young Cy’s 20 wins, therefore, constituted virtually 40 percent of the team's victories. With any kind of run production behind him — the team’s anemic .234 batting average was the lowest in the league — Young would have easily had another eight or ten games in the win column. Ironically, Young Cy’s namesake — the winningest pitcher in baseball history and the man for whom the Cy Young Award is named — had a very similar season. Pitching for Boston’s American League entry (the team we know now as the Red Sox), he also lost one game more than he won. His record for the year was 18-19. In late September, the Pirates offered to purchase Young for the then-hefty price of $7,500. But Boston management would have none of it. The Bangor Daily News, in a September 29 article, put the area’s many Beaneaters fans at ease. The paper reported Boston management as emphatically stating that “Such a deal will not be thought of” — Irv was just too valuable to the team. That the offer was not accepted, however, was most unfortunate for Cy the Second. With the Pirates he would have been with a winner. With Boston he was destined to forever pitch for a loser. In 1905, the Boston Nationals had not just one, but four 20-game losers. Joining Young in ignominy were Chick Fraser (14-21, 3.28); Kaiser Wilhelm (3-23, 4.53); and Vic Willis — later inducted into the Baseball Hall of Fame — at 12-29 (3.21). A trade sent Willis to Pittsburgh, where he won more than 20 games in each of the next four seasons, 1906-09. There was a moment in October 1905 when Cy Young and Young Cy faced off against each other. That year, the Boston Americans and Boston Nationals faced off in a postseason best-of-seven exhibition city series, all of the games played at the Huntington Avenue Grounds. The Nationals won the first game. In the second game, played on October 10 in front of nearly 8,000 spectators, the two Youngs went head-to-head. Cy Young himself was said to have been “out to make his showing against the much-touted National League star.”13 The Americans prevailed, 3-1, with Cy Young allowing just two hits, walking no one, and striking out 15 (including the Nationals pitcher three times). Young Cy yielded eight hits (one to the Americans’ pitcher), while walking one and striking out four. Even though the Americans won Games Two through Five, the two teams played out the seven-game series, the result being that the Americans won two more games as well, taking the series six games to one. In 1906 the Beaneaters were even more futile than the year before. Tenney was still at the helm. Their batting average dropped to .226; their won-lost record to 49-102; their starting catcher batted .189; their second baseman hit .202; and reserve outfielder Gene Good — a sometimes actor/sometimes ballplayer who weighed in at 126 pounds — stroked a lowly .151. The team made 11 errors in one game in June. They were the doormat of the league, and almost nothing Young did was going to change that. As in 1905, Young had kicked off the 1906 season brilliantly, throwing a one-hit, 2-0 shutout in Brooklyn on Opening Day, April 12. He walked no one. The only hit was a first-inning double to left field by Harry Lumley, who then got himself thrown out trying to stretch it into three bases. Boston committed three errors, one of them by Young (who also struck out three times). In that second season in the bigs, 1906, Irv again led the National League in innings pitched (358⅓), games started (41), and complete games (37). He was fifth in the league in strikeouts and his earned-run average remained virtually unchanged at 2.91. Yet with the club worse than ever — the Beaneaters lost 19 games in a row during one especially dismal stretch in May and June — our man from Down East saw his record drop to 16-25. Just as in 1905, Young was one of four 20-game losers on the team. In 1906, the other were: Gus Dorner (8-25, 3.65); Vive Lindaman (12-23, 2.43); and Big Jeff Pfeffer (13-22, 2.95). John McGraw — recognizing talent when he saw it — offered $10,000 for the southpaw, only to be turned down.14 Boston management clearly liked Irv Young. So did his teammates: When he got married in September, they bought a brass bed for the new bride and groom. On September 12 in Boston, Young married Elizabeth C. Myers of Boston, “a young social favorite of the Dorchester district”; the pair had met two years earlier, when Elizabeth, a baseball enthusiast, was vacationing and saw Young pitch for the Concord team.15 The couple had one child, a daughter named Syldania, born in 1909. Before the start of the 1907 season, the futile ballclub’s ownership changed hands. The new owners were a Pittsburgh theatrical man named John Harris and two brothers, George and John Dovey from Kentucky. The Doveys ran the team and, in their honor, the club’s nickname was changed to the Doves. It was an appropriate appellation: On the field the team was almost invariably the per­sonification of peace. Young was, however, the last to sign. “Better late than never,” he said.18 They finished seventh, 47 games behind the front-running Cubs. Still under Tenney, their record had improved to 58-90. But the toll of constant­ly losing was having its effect on Cy the Second. His earned-run average jumped to 3.96; his won-lost record fell to a most disheartening 10-23. For the third year in a row, Young had lost more than 20 games. This year he held that distinction alone; no other pitcher lost more than 16. For the entire season, Young was 8-12 with his lowest-ever ERA, 2.42. It was not good enough. Young had an excellent season, winning 23 games (23-18), with a 2.31 ERA. It was enough to earn him one last shot in the bigs. Charlie Comiskey, owner of the Chicago White Sox, picked up his contract for 1910. For the White Sox, Young pitched effectively, sporting a 2.72 ERA. Again, however, he was with a weak club. Poor Irv was forever with bad clubs: in the two years he toiled for the Chisox, the best that can be said is that their record improved from 17 games under .500 to three games over .500. The 1910 White Sox won 68, lost 85, and finished sixth. In 17 starts, Young Cy was 4-8. It is worthy of note that all four victories were shutouts. The year 1911 was Irv Young’s last in the major leagues, and the team was 77-74. His record was 5-6, but his ERA leapt to a career-high 4.37. With a week left to go in the season, the White Sox released him back to Minneapolis.25 He won a key game against Toledo on September 24.26 The Millers finished first in the standings. Young remained in the American Association, pitching for both Minneapolis and later the Milwaukee Brewers, through mid-1916. His teams finished first four years in succession — in 1911, 1912, 1913, and 1914. 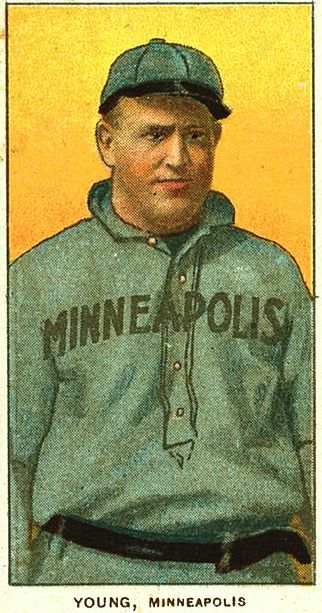 He was 16-14 for Minneapolis in 1912. His combined record for the two clubs in 1913 was 15-10. In both 1914 and 1915 he was a 20-game winner for the Brewers (20-16, 2.87) and 20-18 (2.62), respectively. He threw a league-leading seven shutouts in 1915, six of them before July 1.27 In 1916, he was 0-3 in 16 appearances. Young later played and coached in the Southern League. Later still, while living in Orrington, Maine, he played a bit and coached there, too. By 1918, Young was back in Columbia Falls, working in a canning factory that September at the time he registered for the military draft during the World War. Two years later, he is listed as farming — a general farm, living with Elizabeth and their daughter. Young’s career record in the majors sees him 63-95, but with a 3.11 earned-run average that would be the envy of almost any pitcher in the past 100 years. One can only suspect that if Irv Young had toiled for the Giants or the Cubs or the Pirates — the powerhouse, run-scoring teams of his National League heyday — rather than the lowly Beaneaters/Doves, his passing would have instead been front-page stuff. Young is buried in Ruggles Cemetery in Columbia Falls. A brief version of this biography originally appeared in Will Anderson’s self-published 1992 book Was Baseball Really Invented in Maine? and is presented here with the author’s permission. Bill Nowlin has added new material, expanding on the original biography. Thanks to Elizabeth Stevens of the Bangor Public Library for assistance. 1 United States Census, 1900; and Harold Kaese, The Boston Braves, 1871-1953 (Boston: Northeastern University Press, 2004), 111. 2 “Young Cy ‘Find’ Of Season,” Tacoma (Washington) Daily News; August 12, 1905: 17. 3 Young’s earlier history in New England was described in “Irving Young, Pitcher of Concord, N.H. Baseball Team, Has Enviable Record,” Boston Herald, July 4, 1904: 5. 4 “It Wants ‘Young Cy,’ ” Boston Globe, June 13, 1905: 11. 5 “National League: Brooklyns Make Good Start, but Are Finally Beaten by Boston,” New York Times, April 19, 1905: 12. 6 Bill Swift, from South Portland, Maine, won 21 games for the 1993 San Francisco Giants. This occurred after the original author’s article was written. 7 “National League: New Yorks Could Not Hit Young, but Landed on Willis and Won,” New York Times, June 4, 1905: 22. 8 “Find of the Year,” Boston Journal, June 5, 1905: 4. 10 “Sports and Athletics,” Biloxi (Mississippi) Daily Herald, August 25, 1905: 3. 11 “Winning Run Scored in Twelfth Inning,” New York Times, June 25, 1905: 9. 12 “New Yorks Shut Out, Then Beat Boston,” New York Times, September 8, 1905: 7. 13 “‘Old Cy’ Stacks Up Against ‘Young Cy,’ ” Boston Globe, October 11, 1905: 2. 14 See, for instance, “Giants After ‘Young Cy,’ ” Boston Globe, July 17, 1906: 8. 15 “‘Young Cy’ Young Weds Enthusiast,” Boston Herald, September 13, 1906: 13. 16 “Murphy Controls Chicago ‘Cubs,’ ” Rockford (Illinois) Morning Star, October 18, 1906: 2. 17 “After Young Cy Young,” Hartford Courant, December 18, 1906: 9. 18 “‘Young Cy’ Climbs On to Tenney Wagon,” Boston Herald, March 1, 1907: 9. 19 “Young ‘Cy’ May Go,” Boston Globe, July 22, 1907: 5. 20 Ben Tavis, “Why Able Baseball Pitchers Sometimes Lose Their Cunning,” Lexington (Kentucky) Leader, June 14, 1908: 5. 21 “Great Victory for Young Cy,” Los Angeles Times, August 23, 1908: VI1. 22 “Famous Pitcher Hustles Freight to Prepare for Next Campaign,” Daily Illinois State Journal (Springfield), February 7, 1909: 9. 23 “White Sox Will Get Four A.A. Players,” Kalamazoo Gazette, April 14, 1909: 6. 24 Stew Thornley, On to Nicollet: The Glory and Fame of the Minneapolis Millers (Minneapolis: Nodin Press, 1988), 27. 25 “Olmstead and Young to Minneapolis,” Daily Illinois State Journal, September 24, 1911: 14. 26 “Minneapolis 6, Toledo 1,” Omaha World-Herald, September 25, 1911: 4. 27 Sam Weller, “Cy Young Leads in Using Brush,” Chicago Tribune, October 31, 1915: B4. 28 Hilda Noyes McLean, “I Remember … Baseball’s ‘Young Cy’ Young,” Down East Enterprise (Camden, Maine), November 1971: 98. 29 “Irving Young,” Bangor Daily News, January 16, 1935: 10.